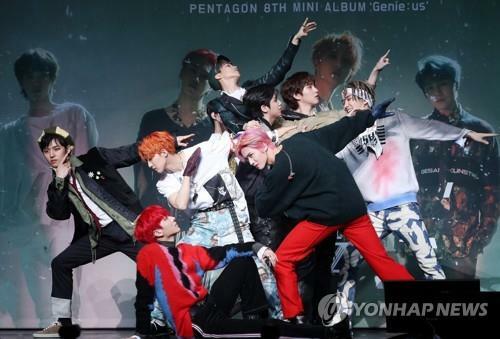 K-pop boy band Pentagon on Wednesday released a new EP, “Genie:us,” the first Korean-language album the band has dropped since the departure of member E’Dawn late last year reshaped it into a nine-member group. The speedy, heart-thumping beats of the lead song combine with the nine members’ military-precise, powerful dance moves to shatter the tension and stress of everyday life. A high-pitched shout by lead vocal Jin-ho midway through the song brings the music to its climax. “You might have moments of stress and feelings of suffocation on your way from work and in school. I wrote the song to resolve them,” team leader Hui said in a press showcase for the new album at Blue Square in central Seoul. 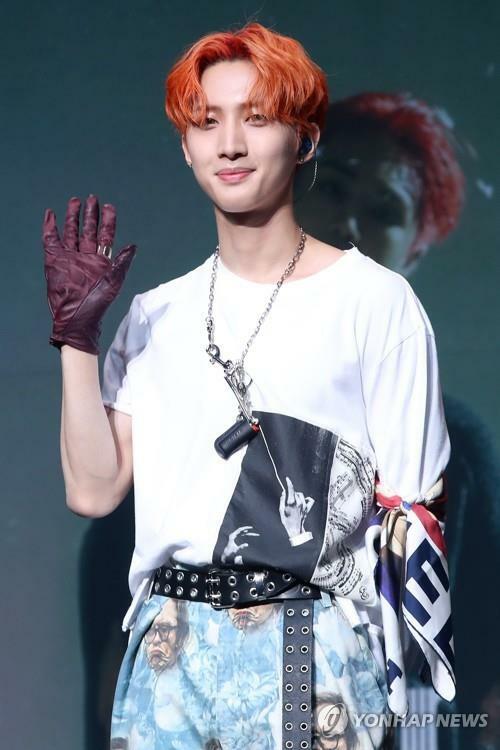 The song became the lead track of the new album as its stress-relieving power strongly appealed to Hui and the other members, themselves under immense stress at the time ahead of the fresh music release, the team leader said. Its music video visualizes the stress-killing quality, exhibiting cathartic scenes like hammering a piano and breaking out of a mound of paper money. “We sometimes reminisce about it. When we staged our first album during a (local) music competition show, we almost broke the floor. We made a crack on the stage because we were so full of energy and ambition,” Hui said. All six tracks — two powerful house and hip-hop numbers and four other playful and sentimental songs — were put together under the shared theme of providing hope and encouragement, member Shin Won said. The new album is Pentagon’s first Korean-language music release without its original member E’Dawn. He was kicked out of the team and its management agency Cube Entertainment late last year after publicly acknowledging his romantic relationship with labelmate HyunA. The two artists worked with Pentagon leader and producer Hui under Cube’s coed trio Triple H.
After leaving Cube, the couple signed a contract with P Nation, a new management agency established by global K-pop star Psy. The performance of “Sha La La” will also come without another member, Kino, who sustained a leg injury while practicing the choreography. “I hurt my leg two months ago while practicing. I focused my attention on recovering from the injury as fast as possible, possibly before our comeback, but it didn’t heal quickly enough,” Kino said, joining the stage conversation after the showcase. Shin Won was so ambitious as to reveal his wish to take No. 1 on the music charts with the new album. But Hui, the team leader and the composer of the lead track, said it will be good enough to rank in the top 50. The band grew in popularity at home and abroad with its 2018 song “Shine” off its sixth Korean EP “Positive,” hitting the Top 10 on Billboard’s World Digital Song Sales chart.